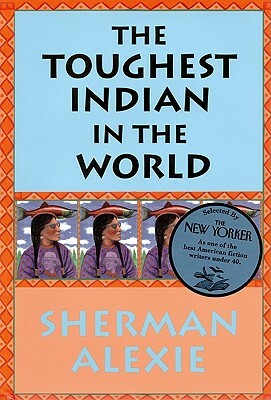 A beloved American writer whose books are championed by critics and readers alike, Sherman Alexie has been hailed by Time as "one of the better new novelists, Indian or otherwise". Now his acclaimed new collection, The Toughest Indian in the World, which received universal praise in hardcover, is available in paperback. In these stories, we meet the kind of American Indians we rarely see in literature -- the kind who pay their bills, hold down jobs, fall in and out of love. A Spokane Indian journalist transplanted from the reservation to the city picks up a hitchhiker, a Lummi boxer looking to take on the toughest Indian in the world. A Spokane son waits for his diabetic father to come home from the hospital, tossing out the Hershey Kisses the father has hidden all over the house. An estranged interracial couple, separated in the midst of a traffic accident, rediscover their love for each other. A white drifter holds up an International House of Pancakes, demanding a dollar per customer and someone to love, and emerges with $42 and an overweight Indian he dubs Salmon Boy. Sherman Alexie's voice is one of remarkable passion, and these stories are love stories -- between parents and children, white people and Indians, movie stars and ordinary people. Witty, tender, and fierce, The Toughest Indian in the World is a virtuoso performance by one of the country's finest writers. Description: 238 pp. Virtually new, no markings, gift quality. Dust jacket has pasted circle sticker noting Alexie is one of best under-40 American fisction writers, according to the New Yorker. Alexie, a Spokane Indian, writes about middle- and upper-class Native Americans in urban settings, coping with some of the same issues as white neighbors. Size: 8vo -- 8.5 In. Keywords: FICTION. SHORT STORIES. NATIVE AMERICAN.